"Radical thinkers might have a point"
The book explains why the financial system that evolved from the early Italian bankers can expand no further. Then it examines the contradictions, wishful thinking and paradoxes that give rise to so much financial trouble. To escape this system limit, evolution is needed, but the obsession with regulation and conformity act to prevent evolution. 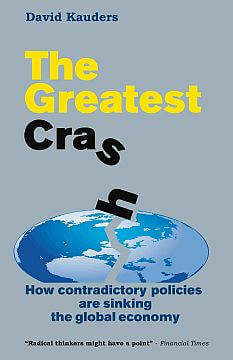 The book is clearly written and will be of interest to anyone concerned about the state of the financial world. You will learn why there is no choice between austerity and growth, or between taxes and spending. Read the e-book on any PC with downloadable software. Print editions are indexed, e-books have full navigable table of contents. E-pub edition has navigable footnotes. ISBN 9781907230356 price may vary.